If you are planning your own project, this month’s news report looks at the implications of the possible end to extended Permitted Development Rights. 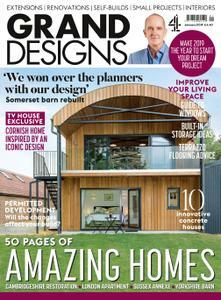 And, in Grand Designs UK magazine there’s indepth advice on how to successfully manage your own self-build; keeping things on track and on budget. Take a tour of five innovative real homes: a modernist coastal new-build featured on the latest Grand Designs TV series, an extended London flat, a restored former dray house, a rebuilt Yorkshire barn and a beautiful bungalow in Sussex where the interior flows naturally into the garden. Also, don’t miss the buyer’s guides to choosing windows and laying a terrazzo floor, as well as the latest kitchen work surfaces, buying bathroom furniture, and design ideas for built-in storage.